Your garage is often the most neglected room in your home. It gets dumped with everything from garden tools, to sports gear as well as everything to do with the car. In many cases it gets so full there is hardly any room for the actual vehicle itself. If you could transform your garage into a multi-use room you could end up with a room which is high functioning and accessible for all of the family. Below we will take a look at examples of high functioning rooms which I hope will inspire you to begin your garage weekend make-over. For most young families, keeping the kids active is really important. The garage will usually store all of the equipment needed to enjoy an adventure-packed lifestyle. This can include sports bikes, roller skates and blades, skate boards, tennis racquets, surf and boogie boards as well as balls and bats from all codes. A great way to manage most of these sporting items is by hanging them off the walls. It frees up the premium floor space but is also very practical in terms of accessibility. Rather than having bikes piled one on to of the other, having them hung off the wall keeps them secure and easy to access when required. StoreWALL offers a bike ready hook which can be used to hang pretty much any bike, big or small. We also offer larger brackets which are ideal for your surfing, skiing and general water sport equipment. By using the full length of the wall through the use of slatwalls, you can avoid shelving taking up all of the space. Shelving has its place but it is also a bulky storage system which isn’t easy to relocate. It can also begun challenging when needing to access smaller items that fall to the back of a shelf. A great way to manage your space is through the use of Zones. It makes items easy to find but also access and return. Grouping your sporting goods together will give your kids ideas next time they are in the garage. The same applies to your camping or water gear. Having the range of equipment visible can motivate kids to put them on and get active. Roller blades are a great example. Stuffed inside a box, means they are forgotten and hardly used. On a bright sunny day, they could be a Sunday afternoon full of action. Shelving is an important storage component for all garages. It gives you the ability to crate layers of storage as well as protect your goods by having them kept within containers. Bottom Shelf – The bottom tiers (closest to the ground) of a shelving unit should be used for storing large, heavy items which are harder to lift and move around. Everyday items that are used regularly should ideally be stored on the middle shelves so that adults as well as kids can access them when required. If you are using containers, clear labelling can assist with keeping everything neat and in place. The less used and seasonal items should be stored up high so they are out of the way. The same applies to valuable or dangerous items like power tools and chemicals. Ideally this type of equipment or material should be locked away so that it can’t be spilled nor tampered with and dropped or damaged. 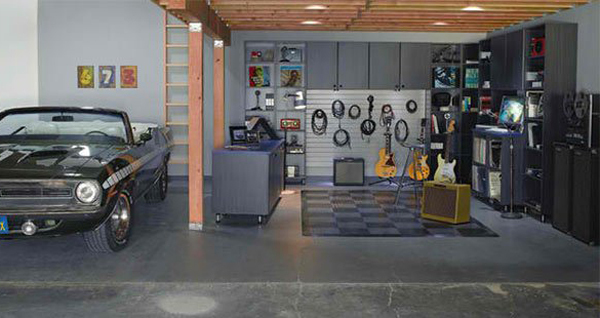 Sports equipment and power tools aren’t the only way to make great use of your garage space. 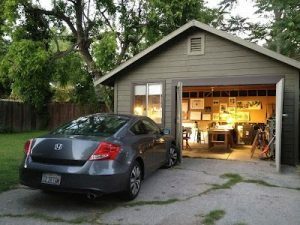 If you are creative, a room the size of a garage could be converted into your very own visual studio. By covering the walls with plaster or even slatwall you can keep the room insulated and moisture free. Some carpet or a rubbery tile on the floor will keep it warmer and cleaner. By adding windows or even sliding doors rather than your traditional roller door you can also bring in much needed natural light and ventilation. Remove the clutter and chaos and you have a room which can inspire you and the family to create works of art or simply just works that you can enjoy creating. Once again slatwalls can provide the perfect solution for making great use of your walls. Small and large hooks can assist with hanging material and equipment. Baskets and shelves can hold paints, brushes, canvases, materials and samples. Off the floor and within easy reach makes working easy and a lot more enjoyable than keeping it all tucked away in boxes or containers. For those bits and bobs StoreWALL offers a great range of slotboxes and bins. Small, medium and large sizes are a perfect way to separate smaller materials which otherwise could be thrown together into an impractical mess. StoreWALL has chrystal clear bins so that you can actually see what is stored inside. Alternatively labels can also be added. Bins can be easily arranged high and low on the wall for easy reach. Deciding to transform your garage into a multi-use room doesn’t need to be an expensive exercise. For under $1000 you can begin by transforming several walls of your garage with slatwall, shelving, bins and baskets. Once you have started you will be the envy of your neighbours.